World Soil Day (WSD) is held annually on December 5th as a means to focus attention on the importance of healthy soil and advocating for the sustainable management of soil resources. An international day to celebrate Soil was recommended by the International Union of Soil Sciences (IUSS) in 2002. 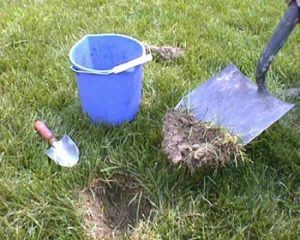 A soil test can provide information on the proper amount of lime and fertilizer to apply to your lawn, garden and other areas of your landscape. When gardeners apply only as much lime and fertilizer as is necessary and at the appropriate time, nutrient runoff into surface or ground water is minimized, money is saved, and plant health is optimized. Soil testing can also be used to diagnose common nutrient deficiencies for plants that are growing poorly. Virginia Cooperative Extension recommends that the soil be tested every three years. More than a third of garden samples tested by the Virginia Tech Soil Lab have too much lime, creating an alkaline soil that can cause micro-nutrient deficiencies in plants, yet many gardeners blindly add lime to their garden and lawn yearly. So Don’t Guess, Soil Test! Soil Test kits may be obtained from the Henrico Extension Office or at your local Henrico Library.